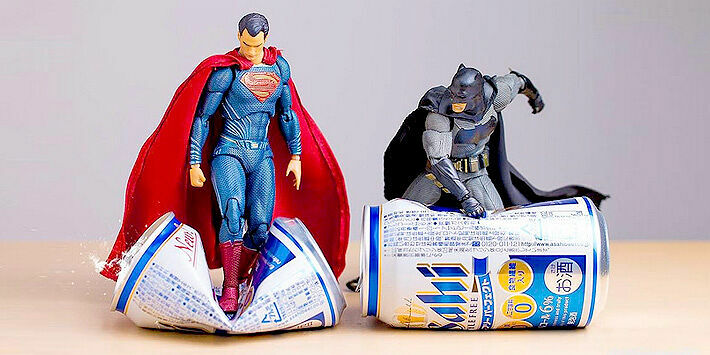 Japanese photographer Hotkenobi likes his DC and Marvel action figures so much he poses his, what must be, rather large collection of action figures into scenarios where the superheros are caught battling each other, pranking each other, consoling each other, hanging out together and doing all manner of hilarious activities in these very awesome photos. The finished results of Hotkenobi's efforts are then uploaded to his Instagram page. His pseudonym no doubt is a possible reference to Star Wars' Obi-Wan Kenobi. The pics are brimming with activity and fun, featuring superhero crossovers of superhero action figures from the Marvel and DC universes. Because while in the movies and comics Marvel and DC are rivals whose superheroes and villains never meet, in the photos of Hotkenobi the two worlds of his DC and Marvel action figures cross all the time. It's kind of like what you hope your action superhero action figures get up to when you leave the room. We get Harley Quinn causing trouble for Captain America, Joker and Batman action figures mouthing off to Iron Man and Black Widow. Along with crossing superhero worlds Hotkenobi also poses his superhero action figures doing all kinds of neat stuff, like Spider-Man crushing a beer can with his webbing. We also get a lot of fun like Deadpool stealing Thor's hammer, Hulk smashing through a can of beer, Iron Man and Captain American striking a pose while dancing, or Wolverine popping the lid off a bottle of Budweiser with his claws. It's not just DC and Marvel action figures either, others include Star Wars action figures and Bruce Lee. The Star Wars action figures include Rogue One droid K-2SO hanging out with an Ewok. Or a Stormtrooper calling his mom and breaking down because he doesn't want to build the Death Star any more. Along with plenty of geeky jokes, to add a little something extra to the scenes, Hotkenobi also puts in some special effects to make the images featuring these action and toy figures come alive even more. According to RocketNews24 Hotkenobi's DC and Marvel action figures have been shared online in Japan thousands of times. And you can see why. They are totally freaking awesome. Take a look at some below.